Rain fell heavily upon us when picking up our review RAV4. So much for outdoor photos or drone video on this vehicle. And so much for a spirited drive along Pacific Coast Highway through Santa Monica, through Topanga Canyon and in to Woodland Hills. It soon dawned on us that our review method involves treating a car as we would our very own. This includes making a COSTCO run, trip to Lowes, and daily errands. Sparkly Southern California weather patterns rarely allow us to test cars in torrential rain, i.e., the real world. The game is afoot. Shortly put, Toyota's 2016 RAV4 Hybrid Limited is a champ in wet conditions. Seven inches of ground clearance combined with a relatively high seating position and Electronic On-Demand All-Wheel-Drive system quickly put all control questions to rest. A 2.5L 4-cylinder gasoline engine coupled to two electric motors, produce a total output of 194 horsepower. The AWD system (with intelligence!) senses traction control needs at each wheel. Immediate distribution of power keeps all four wheels in contact. 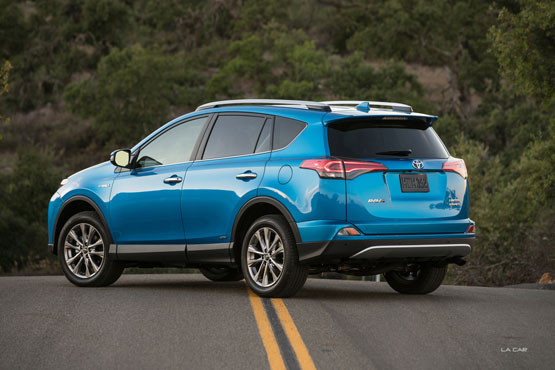 Our RAV4 Hybrid is as stable, predictable, and comfortable as anything in this class. Toyota has been in the hybrid-making business as long as anybody and it shows. The engine is smooth, transitions between propellant modes are barely noticeable, and our on-board computer indicates 31.4MPG over 342 miles of driving. RAV4 Hybrid base price is $33,615. Our Advanced Technology Package and destination charge lifts the price to $35,950. 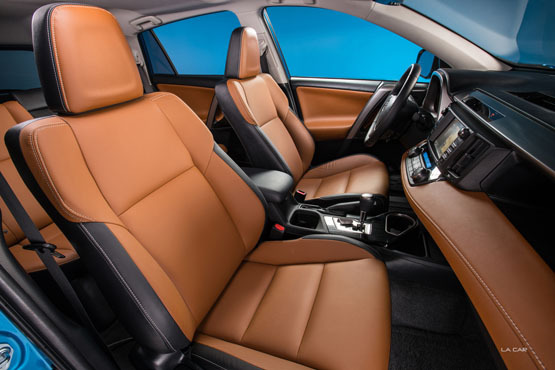 The Softex-trimmed interior adds a touch of luxury and comfort over previous material options. An 8-way power adjustable driver seat allows ample room for taller drivers while the seat memory function is quite handy when switching pilots. Rear seats are large enough for adults to travel comfortably and the 60/40 folding arrangement readily reconfigures for weekend vintage furniture market trips. RAV4 falls into the mommy-wagon category of vehicles. Mommy wagons are recognized as smaller SUVs, utilitarian, eminently practical, with passable styling. For 2016, Toyota has boosted RAV4's looks with a redesigned front end, new LED headlights, sculpted grill, fog lamps neatly tucked in, and a front air dam to direct wind noise away at freeway speeds. Large side mirrors, tight turning radius, backup camera, and bird's eye perimeter scan (part of the Advanced Technology Package) allows for spiffy maneuvers in today's increasingly tight parking lots. Should fate intervene, there are enough interior airbags to make the Stay-Puft Marshmallow man amorous. Endgame? 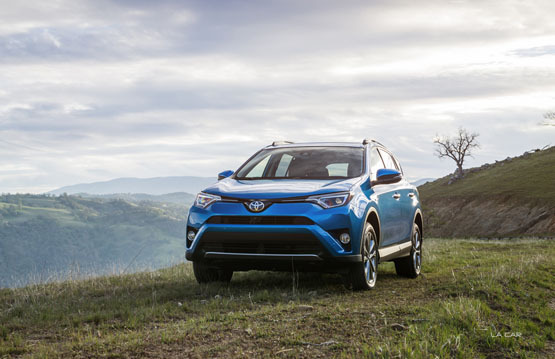 We like the 2016 Toyota RAV4 Hybrid Limited. Updated styling, comfortable/flexible interior, and drivetrain stability make it a well worth investigating whether looking to up-size from a sedan or downsize from a monster SUV.